Lore Raymond: What will you give birth to in December? What will you give birth to in December? You're now moving from November's sacred space of gratitude into joyful expectations of new projects. New dreams. New beginnings. So, how will you embrace December? December is a gestation time. Quiet walks with Mother Nature. Quiet time writing Christmas or holiday cards. Quiet hours of baking and "testing" your samples. I am also feeling pregnant with dreams although I've never been physically pregnant. It was not to be on my life-path. Perhaps you are also pregnant. Full of ideas, words, and hope. So what names would you give these dreams that seek to be birthed? Then, it's off to Bali for my October birthday month! Please also save the date for the Bali Writer's & Reader's Retreat, October 18-28, 2018. A co-ed adventure, it coincides with the International Bali Writer's Festival and four days of cultural workshops, film, and live music and arts. With Daylight Savings Time, the days get darker waaaaay too early. Don't you agree? I miss the lazy, lingering hours of summer's light. Luckily, the constellations always bless Tampa Bay. They dazzle like rhinestones on a navy blue velvet dress. Mother Nature is indeed one talented seamstress. There's something very soul-soothing about trusting that the moon and stars will always show up. Think about it. The stars appear every night regardless or what's happened in the world. Nightly news never reports, "The stars came out (or didn't come out) tonight!" Best of all, this light show costs nothing. No power bill ever arrives. When I see the ancient December night sky, I am also reminded of a pregnant teenager. 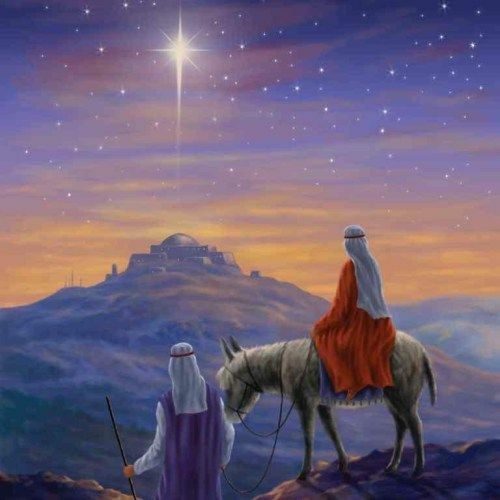 Thousands of years ago, she traveled as a young girl nine months pregnant on a donkey under the stars. She and husband Joseph journeyed to an unknown and unwelcoming place to an uncertain destiny. The stars remain in their places. I see what she saw though we never met. We meet in the sky this mother and me, an adopting mother. We understand the state of being pregnant with desire. What courage you expressed, Mary, to give birth. May you fearlessly give birth to your December dreams! Who knows, your dreams might change the world. 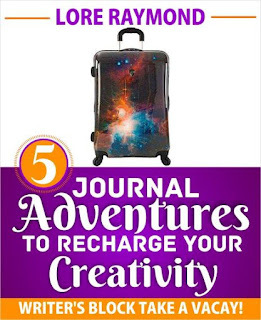 5 Journal Adventures to Recharge Your Creativity: Writer's Block Take a Vacay! While it focuses on helping you release writer's block, it applies to releasing any creative block. Please let me know what journal adventure you enjoyed! I love to use every December to complete Leonie Dawson's year book, it is a great way to close and bless the passing year and set goals for the next one. BRAVA! And congrats on all these wonderful new "kids" for the world to experience and enjoy! xo Hope to see ya in Key West, Peggy. I like to use December to take stock of the year, my highs and lows, and where I ended up from where I started. I find the areas that need attention and contemplation, and give them the gift of my presence. This year I am birthing a new life style and a new way of looking at life and work in general. Happy dance time for a new lifestyle, Barb! How would you describe it? When this happened to me, I chose a dressing style, like WHAT IF I DRESSED like a preppie New Englander? THen I went to Goodwill and had a blast! Seeing that financial ease flowing to you like your beach waves, Suzie! I agree, Lore: "Mother nature is one talented seamstress." I am always in awe of her generosity. Thanks, Lea. I know you enjoy a special connection with Mother Earth. Thank you for the lovely nudge here. Looking forward to seeing and supporting those new BUZZING ideas, Zeenat! Ahhh, BIG congrats, Lira! It's no small feat to birth a website. Wish you'd shared the link here. And my shoe brand, flats for career and busy women like me, who can’t stand the stressed of heels but still want to stay classy and chic. Apprehensive but confident and at peace. TRIPLETS! How exciting, Leila! Sending you prayers for a happy and easy "deliver" with your kids. Love your analogies. "Pregnant with dreams". Brilliant. Thank you for the seed. Thank you, Laura, for your kind words. Happy seed planting and harvesting! Hi Lore, I love this and looking back it does feel like I birth things over the winter months and this December is no different. I - GULP - have created a new healing modality and have begun my new book on it. It will be something people can use for self-healing, for helping others and for things like plants, water, etc. I have had sessions with about 10 clients so far and they are seeing huge shifts. I begin promoting it this week and am excited and yes a bit nervous to put this out to the world. My book is about 6,000 words in and is flowing. The modality is called BE LIGHT (an acronym for the steps used) and it helps to release the old to allow us to connect deeper with our souls and true potential. Thank you - this is the first place I have announced this publicly - the post will be out within 24 hours - just dipping my toes in! ;-) Sending much love for your December and beyond! I am birthing a book proposal this December! It has been a journey of up and downs and back and forths, but finally I have the rough draft done and the final is near completion! December is literally my birth month, as I celebrate the 6th year since my heart attack, I am so grateful! How exciting for you, Camy! The first is always special an memorable for many reasons which you're now discovering I'm sure. Keep me posted on your baby's arrival! After the first of the year I am finally going to buckle down and finish the last book of the Third Age Trilogy. Then I am going to do something totally mystical and new ... write a work of fiction based on an actual dream that I had! I have no idea where it will take me, but I can't wait to get started! Oh,both book titles sound so intriguing, Barb! Sounds like your're preggers with twins. Now that's something for your Thirs Age to write about, hahaha! What a lovely post. I have just completed the 50,000-word "mind dump" that is #NaNaWriMo. As a non-fiction author, I sometimes use the community and the deadline to spew out a really, really lousy first draft. (One November it was 50,000 words on ideas that turned out to be The Inner Critic Advantage -- which could be good for the Inner Editors who show up at your workshops. We should talk.) I also just received a very nice offer from an Asian publisher. (I LOVE having my books published in other countries.) And, although one of my partners is facing some family medical issues, December hopes to bring about the launch of an author services site that has been a dream for some of us here on the island. All such eciting news! Lots of birthing going on, Andrea. Please keep me posted on the arrivals and let me know how I can support. And yes to chat about the Inner Editors who DO show up at my workshops and retreats! I'll message you. Congratulations on all that you have set out to do in 2018, Lore. 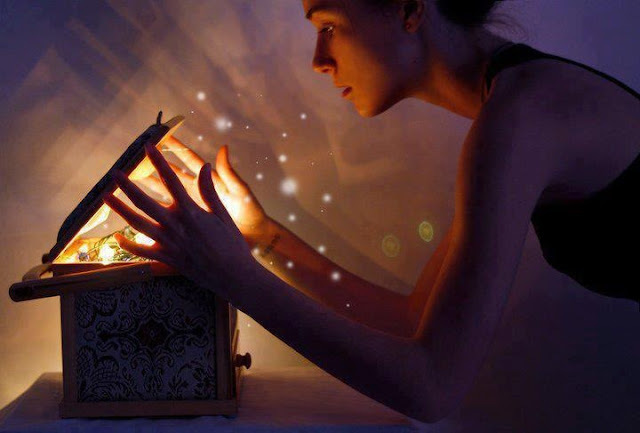 May all your dreams come true. Many thanks for your kind wishes, Cindy! The same to you. May 2018 bring you peace, joy and all that your heart desires. Beautiful post, Lore. I share that same moon and starry sky with you and all who walk this beautiful earth. December will birth a new chapter in my life. I feel so excited and blessed. Best, best wishes on your writers' retreat - sounds amazing! Thanks as always for your kind words, Reba. You are such a sweet soul and one day I hope our paths cross and we can enjoy the moon and starry sky over some soul-full conversation. According the the universal energies what we give birth to in November will manifest in December. November has definitely been full of ideas, words, and hope. My desire will only increase in the coming days, weeks and months. I had never heard about "According the the universal energies what we give birth to in November will manifest in December." Interesting. Thanks for informing!